Anti-sweep hooks in a locked security cage. Maybe the strategy is if the lock doesn’t stop you the anti-sweep hooks will delay your theft of all contents until Store Security arrives?. Obviously, this chain takes no chances. To defend their fixturing however, let us assume that they just order anti-sweep security hooks for all their theft-prone merchandise … that way there is a perfect one-on-one match of fixture to facing. If some goes in a lockbox, no harm that a n anti-sweep hook is the fixture. For store locations without a security cage, the anti-sweep hook is already available and used. 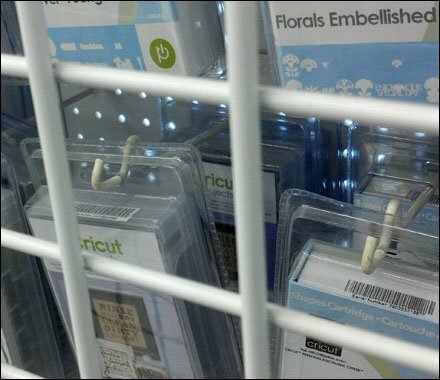 But if I were less an optimist, I might think the store staff planogrammed the wrong hooks in the wrong location … but we know that never happens, right?